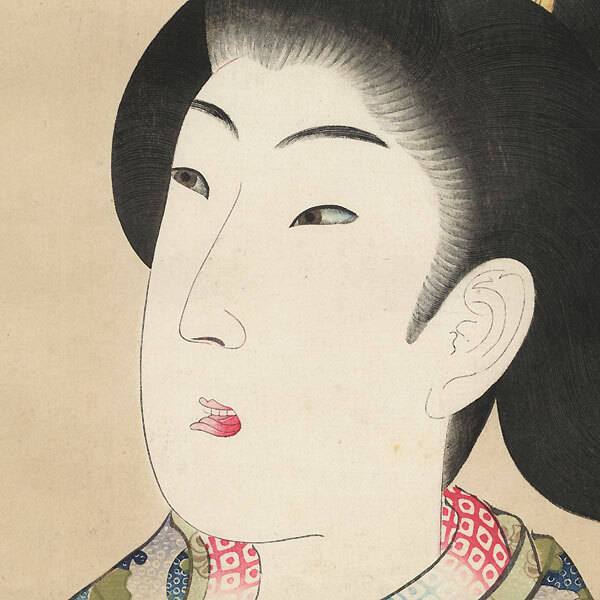 Mirror of the Ages - Published in 1897, Chikanobu's beautiful series "Mirror of the Ages" celebrates the beauty and fashions of women of the past. Each print in this delightful series features a single portrait of a young beauty, always carefully and stylishly made up, wearing the traditional contemporary fashion of her time. 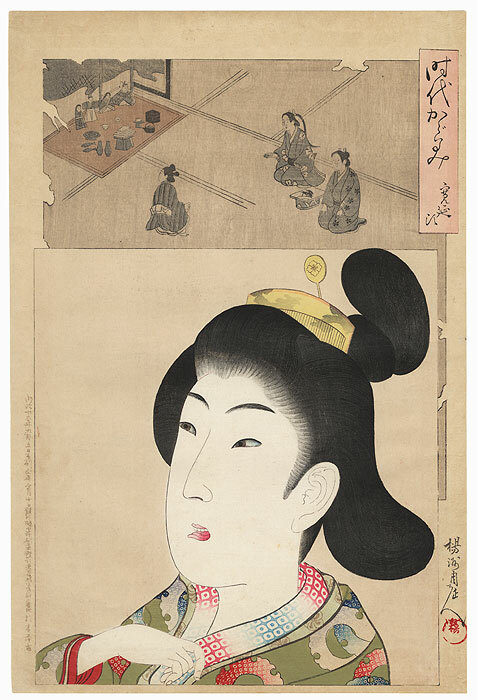 In the rectangular inset above the figure, Chikanobu has drawn a scene from the same time period suggesting a place where one might see this young beauty. This wonderful series was printed to the highest quality with fine line work and soft shading, and often with additional embellishments, such as delicate embossing or burnishing. A lovely series and collector's favorite. 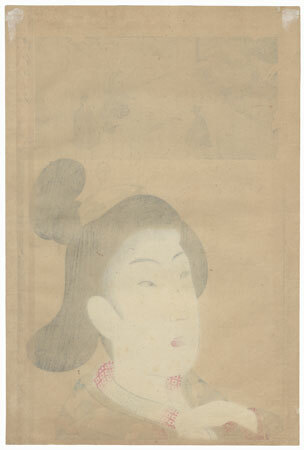 The Kan'en Era (1748) - Attractive portrait of a Kan'en Era beauty, looking up as she holds the collar of her under robe, her mouth slightly open. Her light brown kimono features tie-dyed circular motifs, worn over a pale green floral robe and an under robe with a tie-dyed pattern of tiny squares in red, white, and blue. Her hair is pulled back into a curving mass at the base of her neck, with a knot above held in place with a comb and a decorative hairpin. The inset above shows three people admiring a display of court dolls and accessories for the Doll Festival on Girls' Day. A charming design with delicate line work in the hair and soft color. Condition - This print with excellent color and detail as shown. Backed with paper. Vertical fold at right edge. Slight toning and soiling, a couple small spots, a couple creases at edge. Please see photos for details. Good overall.